First up: this pack contains a purple fabric scrap pack (sharing the love of my favorite color), a little less than a half yard of the diamond print, two fat quarters (swirly purple Cocoon print and the pink print), a large scrap of Soul Blossoms by Amy Butler, and handmade-by-me key fob. 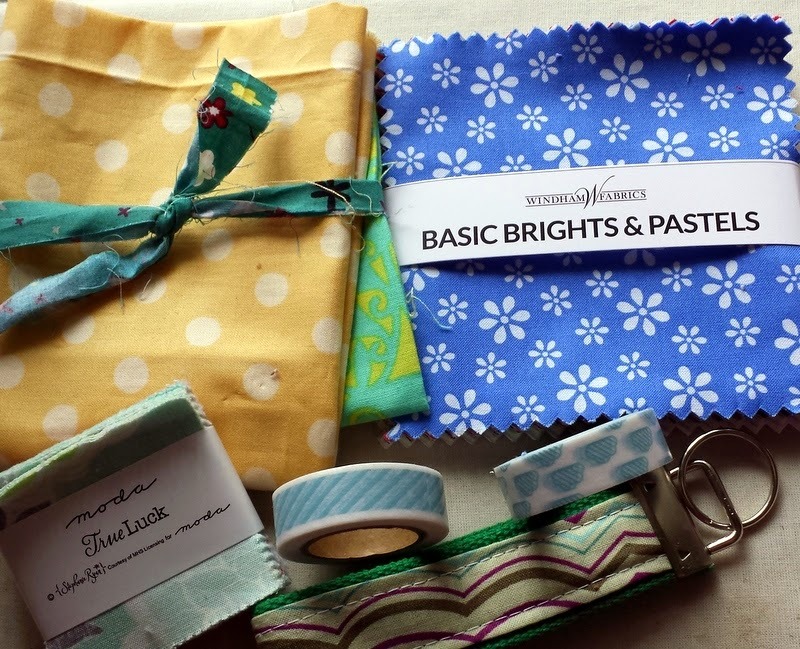 The second pack contains a yellow scrap pack, a True Luck mini charm pack, a charm pack of Basic Brights and Pastels from Windham, two rolls of washi tape from Cloud 9 Fabrics (love!!! ), and a handmade-by-me keychain. This giveaway is open to everyone in the whole wide world. On Sunday, May 10th at 9 pm EST, I will choose two winners using the Random Number Generator. Thanks and have fun hopping! P.S. I usually respond to all the comments that leave email addresses but I will be unable to respond to each person during the giveaway. Thanks for understanding! If I weren't quilting, I would probably be cooking a lot more. And maybe also volunteering somewhere. But I can now give back by making warm quilts for folks in nursing homes, that are veterans, and for kids in hospitals. Doing something I love and making a difference? Nothing better in life. I follow your blog via my Blogger Dashboard. I follow you via Feedly! Both prizes are awesome!!! Gosh, if I wasn't quilting in my spare time, I think that I'd like to learn how to play a musical instrument like a guitar, sax, or violin. I'm following you via Bloglovin!! I'd be doing needed decluttering! but sewing is more fun. If I weren't quilting I'd be playing more music and possibly morris dancing! No kidding! I follow on bloglovin! Great giveaway! I would probably read more- or get more exercise! If I weren't quilting, I'd be reading a lot more, and maybe going for more walks. I follow you on Bloglovin and IG. I definitely wouldn't be singing, that's for sure, because I doubt anyone would want to hear that, lol! But in all honesty, I couldn't imagine my life without crafting. I also like photography, though and plants...so I suppose there would be something or other ;) Many thanks for the chance to win! Both bundles are fab! Would probably read even more than I do and have the grandkids over. Cooking ,dancing and watching movies! I would be driving race cars. Had to give it up and sewing was my alternative. If I were not quilting I would likely be checking out my sizable lists of quilting bloggers. If I weren't quilting all the time, I'd be working on my scrapbooks, something I haven't done in about 5 years. Thanks for the opportunity to win your awesome giveaway. Those key chains look like exactly what I need, along with that lovely fabric. I'm a long-time follower who would love to win your awesome giveaway. I would be reading more - fun reading. In nursing school they don't give us much time for anything, including sewing - but that is what I prefer to spend my few minutes on. You have great bundles up there. I just got through talking with my quilt guild about how hard it is to find good purples. I just finished a purple and blue quilt and probably have the largest selection due to that. We all seem to be lacking in that great color. I would be doing more reading! I'm a follower on Bloglovin'. I'd be losing my mind without my creative outlet, and refuge from less than glamorous moming activities. That's easy-I would be reading. If I have a good book, I don't even think about seeing. I would be learning to play the viper! I follow you through my blogger feed. Thanks for offering the giveaway! I love purple the best, too! If not sewing, I would be sharing stories with my dearest friend who just turned 95 in March! Id probably have a clean house if I wasn't crafting! Sewing is starting to take up more and more of my time but so far I'm loving it. If I had more time I'd probably be reading more (currently just on my commute to and from work) and spend even more time in the kitchen. If I weren't sewing I'd be reading miree, even though I still read a lot! Thanks for the great giveaway! If I wasn't crafting in my free time I'd be reading a bunch more books and my house would probably be cleaner! I'd be reading - which I already do, all the time. I would knit and read. If I weren't crafting, I would be in the garden more and reading more. I have been following with GFC. I would be doing yoga! I would go for a long walk, love nature! Thanks for the chance. well I think i would be searching for something to do. That is what I did before just kept trying to find a hobby then one day quilting! bam never looked back! I'm drooling over the purple bundle you put together, so very pretty. If i weren't crafting I would be cooking, taking random road trips, reading or gardening in the summer. Wait a minute... I do all that anyway! You've got to keep your life fun. I used to date someone that sang in a barbershop quartet so I know about the Sweet Adelines and always wished I could sing. My voice would drive small animals to hide if I sang. I do have a question. Why don't people who can sing do so in random places like the grocery store? I always hear people who can't sing singing in public but rarely do I hear someone who can sing. it always makes me smile when I hear them. Just curious. I've been a follower via bloglovin for quite some time. I'd love to run more. And read more. Thanks for the giveaway. If I wasn't constantly crafting, I would probably have joined a choir or an orchestra, or maybe even both! I would play video games! I'm also a piano and voice teacher to 25 students! I'm a mezzo soprano but have never done barber shop! I would read! :) By the time I am finished sewing at night I am too tired to read. I would do martial arts. In fact, I plan to take it up this summer. Reading & home design & decor! Honestly, I don't have a ton a free time at all. I am a mother of 3 year old twins, I go to school full time, I am a wife, and I work part time. What little free time I do have I usually sew. If I am not sewing, I am reading. I can't even imagine not crafting or quilting. I suppose I would be cooking all of the time as I do like to bake. Thanks for the awesome giveaway. well i'd have a different job if i didn't quilt - i work at the National Quilt Museum! love these. If I'm not crafting I'm reading! If I weren't quilting, I'd be reading even more than already do. Maybe I'd exercise more but I'm not sure. Thank you for opportunity. Hi Jess: I follow you on bloglovin and look forward to all of your posts. You are so talented and enthusiastic. Thank you. The vast majority of my sewing (time wise) is doing EPP on the lounge of an evening, usually with the television. Before I took up sewing, I was reading at that time instead......and at the rate I read, I can assure that this sewing habit is waaaay cheaper! Love that purple mix of yours, it's my favourite colour. I would be reading more (I used to read 110+ books a year, now I'm only around 75/yr) and making CAKES! Fancy cakes, yummy desserts, etc. And I stage managed a women's barbershop festival once. That was awesome. Probably more time outside. I think I should just bring my crafts outside... working on it. I think I'd probably be reading. I think if I weren't crafting all the time, I'd be baking. My grandma taught me how to bake and I'd love to perfect some recipes I love to eat and to share. I'd be baking and eating. I'm a birdwatcher and gardener. I think I'd enjoy a walk or a trip somewhere outdoors! I think i would reading and I really would love chrocheting,lol! Making more of an effort to run, cycle and keep fit in general! 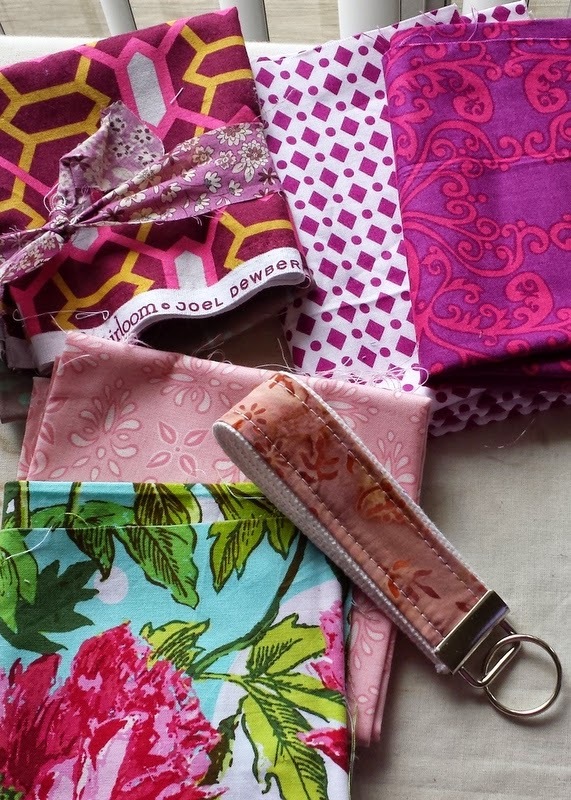 When I'm not sewing I enjoy gardening, reading and walks on the beach with my little dog,Suzi.Lovely giveaway! If I weren't sewing in my free time, I would be crocheting and lifting weights more. If I am not sitting at my sewing machine I am outside playing in the dirt. Love to garden! But if I have to get off my feet I am EPP, love it! I would be spending more time reading too! And I would probably also be caught up on my scrapbooking. I would be cooking. Thank you for the giveaway. I would definitely be reading more. I like making though, because you can actually see something. If I was not crafting? I can't imagine that is possible ...... well I think I would read, and visit craft sites on the web! I hope I'd be doing some much needed decluttering... but who am I kidding??? I'd more like be out buying more fabric! So I started quilting when I was pregnant with my first...and it really does help keep me sane despite all the chaos around, so without it I'd probably be going crazy. Also I was a much more active photographer before getting into quilting, so I might do that. I would read more and play more video games. I have several games that need more attention and and ebook library on my ipad that is very neglected. When I don't sew I read or knit so I always have something to do in my "free time". If I were not sewing I would definitely read more. And would have time to learn all those foreign languages I've started studying but never got too far with. I think I would read or walk outside! thanks for the chance to win! I follow you on GFC. thanks again!! If I wasn't quilting, I would get in to scrappy rug making. I haven't done it yet, but I know it's coming. Thanks for the chance to win! Thank you for the giveaway. If I wasn't sewing, then I would definitely be reading more since I love to read as much as I love to sew. If I wasn't crafting (i.e. quilting) in my spare time, I guess I would be doing housework and have a much cleaner home, lol. I would be painting or doing yardwork... Sigh. I follow via GFC! Thanks for the chance to win! If I wasn't crafting in my spare time I would be on Pinterest or IG searching for gorgeousness to look at!!! Or tending to my veg patch in daylight hours! If I didn't sew I think I would read more and watch less tv too! i'm trying to do audiobooks so I don't miss out on reading when I sew. Aside from sewing I do a lot of drawing - does that count as crafting? Otherwise reading. Lots of reading. I would spend a lot more time baking and cake decorating! I thing I would be a landscaper, I love the summer so I can spend all my time outside working in the yard. I would garden more. I think -- I could be gardening right now and I'm not! If I did not quilt, I would probably read more. My husband took over my Kindle. My house might be cleaner? I really do need to start a garden soon, but it needs to stop raining. Thanks for the great giveaway. I am a follower on Bloglovin under my Michelle N. Folkerts account. Hahah, what a question. I would probably be cleaning my house and feeding my family if I weren't crafting. If I didn't quilt, I would probably spend more time outside hiking, skiing, etc. haha! obviously the things i should be doing! I would probably be eating more and reading a lot more! Thanks for the chance to win! Well, my house would be cleaner and all my freezers full of good stuff to eat!!! I would ride my horse more and I would not have the wonderful quilty friends that I have! Sweet Adelines sounds like fun since I sing tenor! Seasoned follower of your blog via email!! Thanks for the fantabulous giveaway!!! If I weren't sewing/quilting, I would be learning how to cook. I enjoy reading. I just got back from the library with a book I had placed on hold. I'm late coming to the party on the Bennie Harper mysteries and I now can start on "Sunshine and Shadow". Hi Jessica, I subscribe to your Feedly blogs.